You wonder why I make that terrified face ? Go ahead, read…. This picture is from the beginning of my DSLR days back in 2007. 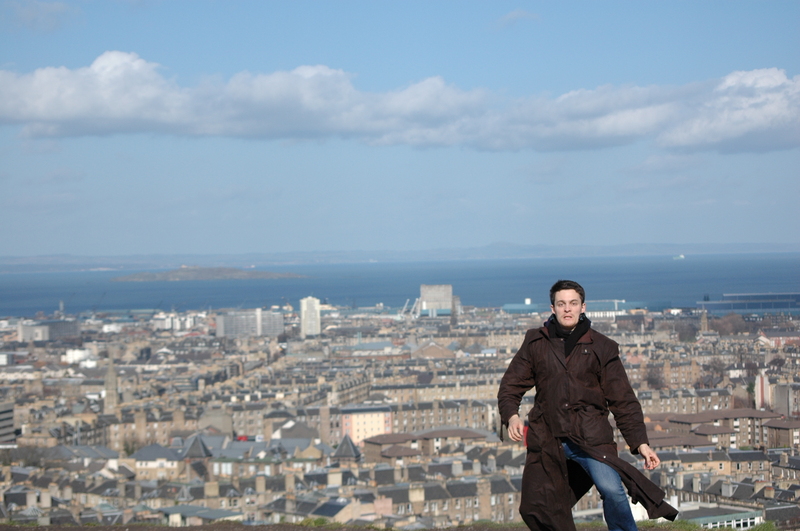 I visited a friend who studied in Edinburgh, Scotland. One day he had to work on a project to meet the deadline so I was on my own. I went into the city and climbed monument hill, from where you have an excellent view over the city. I had my D70s and a rather cheap tripod. It was very windy that day and to stabilize the tripod against the wind I suspended my camera bag from the tripod’s venter column. I though it was a clever idea. I will give you the next ten seconds from that day in keywords. Self-timer set to ten seconds – I pose before the camera, giving my best smile – a gust of wind comes up – wind sets camera bag in motion – bag swings wilder with every gust of wind – the camera bag motion forces the tripod to lean over to one side – tripod starts to lean over, standing only on two legs – my brain realized what happens – With terror on my face I spring into action – the very same moment the tripod comes back to its feet – camera makes click. The image is far from perfect with my legs cut off and the horizon leaning to the left, but I like that image anyhow, since it brings back a story every time I watch it. 2.) Using the camera bag to stabilize your tripod can be a bad idea.